Eeeeeeeeeeeek! 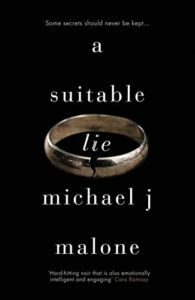 I am absolutely thrilled to be hosting the fantabulous Michael J Malone’s A Suitable Lie blog tour today!! This is one of those books that stays with you and leaves you thinking…Check out my review below for more! I was so desperate to read this book, I could not even wait for the ARC I was being sent from the lovely Karen Sullivan/ Orenda Publishing! Instead, I immediately purchased the kindle version and began to read the second it arrived! Talk about a great opening! I was instantly hooked and wanted more! OMFG ~ have you ever read a book that made you question your beliefs? Made you question your understanding of a topic that remains in the shadows? Pulled at your emotions until you felt stripped bare and exposed? That my #bookjunkie friends…that is THIS book!! 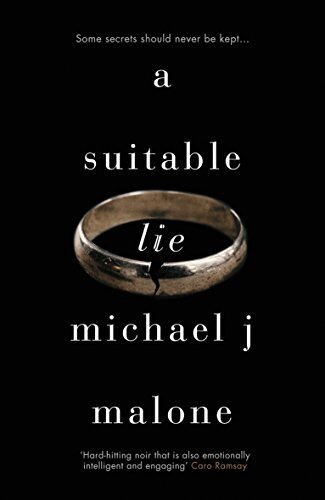 Michael J. Malone has taken a tough and often hidden issue and tore it wide open….but not how you may think! Set in Ayr, Mr Malone weaves the threads of trust, loss, anger, control, jealous, resentment, past trauma and questioning the norm throughout the pages of this story. There is a raw realism that really turns the topic of domestic violence on it’s head. I work with both victims and perpetrators of domestic violence and I am often shocked at the lack of understanding when it comes to male victims. It is real people! Violence is violence no matter the gender of the individual on the receiving end! *steps off her high horse* – sorry, but it had to be said. The pace is perfect for the story and builds up to the climax so we are left gasping for air. I tried to figure out the twists, but Mr Malone played a few cards that threw me right off track! The main character, Andy is believable, strong, vulnerable and controlled. Controlled in his determination of NOT using violence as a defence but also by his wife, Anna – who displays all the signs of a domestic violence perpetrator. The shame, excuses, willingness to forgive are all classic examples of victims of DV – however, rather than being a woman, as we would all expect – Mr Malone shows courage in talking about a subject that is rarely ever spoken about! Superb!! Anna is troubled, and initially very likeable – charming, alluring and easy to forgive. She says all the right things to keep Andy under her control. It is all about power and instrumental violence and this woman uses whatever means necessary to get what she wants. Manipulative, deceitful, making sure Andy is all hers – even if it means using emotional blackmail at the expense of Andy’s son. What an evil cow! ….sorry, it just had to be said! There are other strands within the plot which intrigued me and kept me guessing – all the while being interlinked so we don’t lose sight of the plot. This book exposes the truth we sometimes close our eyes to. Truly magnificent; a superb piece of writing with twists you won’t believe! Guess what, #bookjunkies….this is definitely one of my Top Reads of 2016! (That is two for you Mr Malone! Woohoo!) I cannot recommend this book enough! Head on over to amazon via the link below and download this #badboy – you won’t regret it! Mr Malone DOES rock! The whole McBain series is one of my faves. In fact, I love ALL his books! Over the moon that you enjoyed it. Thank YOU for such a great read!! A review that has me hooked before I’ve even read the first line of the book. Purchased and eager to read. Hey, Noelle – thank you for such a strong review. I love it when a reader “gets” what I’m trying to do. Brilliant! !